If you are looking to find some new movies to obsess over, then you are in luck. October coming to an end in just a few days, November has spectacular movies being released. In just few days highly anticipated movies are to be to released. Here are a few that have gained a lot of attention already. 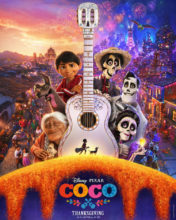 Coco is an upcoming Disney/Pixar musical fantasy film centered around the Day of the Dead. Desperate to prove his talent, Miguel finds himself in the stunning and colorful Land of the Dead following a mysterious chain of events. Olaf’s Frozen Adventure is an upcoming 2017 American 3D computer-animated short film that will be released along with the Coco Film. Olaf is going on a quest to find traditions for Anna and Elsa. A lavish trip through Europe quickly unfolds into a race against time to solve a murder aboard a train. Everyone’s a suspect when Detective Hercule Poirot arrives to interrogate all passengers and search for clues before the killer can strike again. Jeffrey Dahmer struggles with a difficult family life as a boy. During his teenage years, he slowly transforms and edges closer to becoming a serial killer.